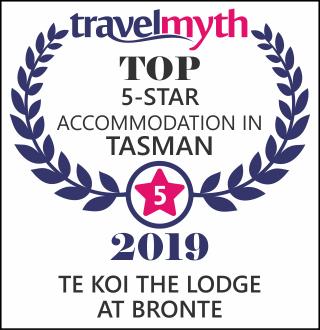 Te Koi has been operating for over 25 years as a luxury lodge on the exclusive Bronte point looking out over the majestic waters of the peninsula. In 2017, the Lodge was taken over by owners, Ian and Ali Metcalfe who have brought a fresh new vision focused around warmth, luxury, and absolute indulgence. The entire property has undergone major renovations, bringing the Suites, Villas and Residence up to the highest quality standards in comfort and design. Furnishings and interiors throughout the property showcase a sumptuous European design aesthetic that beautifully compliments the stunning natural surrounds of the property. The gardens have been immaculately landscaped and additional amenities added. The result is one of absolute luxury and serenity that plays to all the senses. Ali and Ian bring a lifetime of hospitality experience and passion to Te Koi. Ali is a superb professional chef and together they have run award winning restaurants and a high end boutique travel company. Their lives both in New Zealand and time spent living abroad have given them a unique knowledge of what it takes to make their guests feel valued and deliver a very special experience. Come and experience this truly magical location.